The Kissed Mouth: Save Countess Cork! I'm still hiding from the inordinately hot weather (Fan, fan! Swoon, swoon!) and so the second post of this weekend is about saving a beautiful painting from being lost from public view. It's something we can do from indoors, so it is a winner in my book. 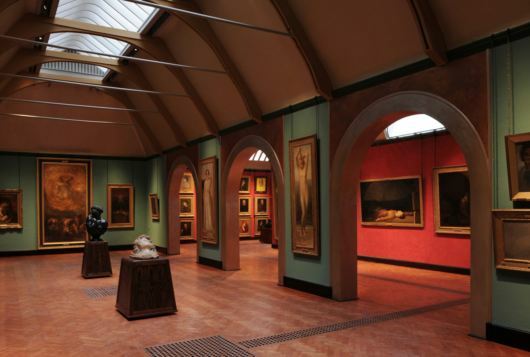 You lot obviously know how much I love the Watts Gallery in Surrey. Where else can you see a giant Tennyson? And their refurbishment has made them such a splendid, world class museum, the perfect home for the beautiful collection. Anyway, they are presently trying to raise money to save a full-length portrait of Countess Cork by G F Watts from being sold into a private collection, and therefore not publicly accessible. 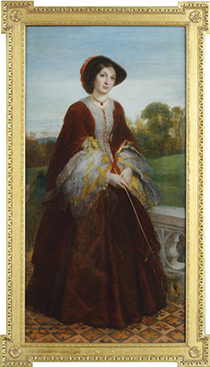 The painting was commissioned around 1860, when Watts was executing some of his most lush and elegant society portraits. Despite having a lot of his later portraits, the Gallery don't have an example of his work from 1860 and this is such a splendid piece it would be marvellous to bring it home to the Gallery. 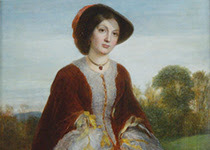 The Countess, Lady Emily Charlotte de Burgh is shown at her Somerset estate, aged around 32 years old. In her hand is a peacock fan, an early aesthetic motif. I think the truly astonishing part of the work has to be the foaming lace at the cuffs, painted in such a way that you can almost feel how soft and translucent those waves are, against the rich darkness of her velvet dress. I think it's interesting that she had had four of her seven children by this point, but not a son yet (Charles came along in 1861 and Robert in 1864). It's interesting to wonder, as the exact date of the painting is not known, whether it might be painted to celebrate the birth of the son and heir in 1861. It is such a lavish, such a beautiful portrait, it feels like it was created for a special reason. The Countess is being shown at the Watts for a limited time, so you have the chance to go and see her in all her finery before donating if you wish, but it would be lovely to help such a wonderful gallery to purchase this work so we can all enjoy it forever. To read about the Watts campaign to raise money for the Countess, go here. To give money to the Watts Gallery's Fund for Countess Cork, please go here. I always find it somewhat disheartening when beautiful paintings are in private collections- like that 'Salutation of Beatrice' by Rossetti that was recently uncovered- hidden away for years in a private collection. There really ought to be something done about it, but I guess the people with the money come first, alas, in art or not. There are obviously many, many private collectors who have the money and the passion for the art who lend their works to exhibitions and allow public access, but from an entirely selfish point of view, I would like to be able to see these works whenever I need to and so, if at all possible, it's wonderful when they can be kept in public hands. The problem now with Victorian and especially Pre-Raphaelite art is that works are well beyond the pocket of most, if not all, museums. When Andrew Lloyd Webber bought the Burne-Jones last week I was relieved that at least he lends to exhibitions. There is no way your average museum could afford millions for such a work. Hopefully there are still lovely collectors who still plan on leaving their personal collections to museums. Or to me. I'd look after them. Promise.